This compact and stylish 2.5 inch silver revolver, licensed by Dan Wesson, offers realistic shooting fun in a handy size. It has authentic markings and an individual serial number stamped into the frame. The revolver features a double action trigger system and adjustable rear sight for extra realism and accuracy. 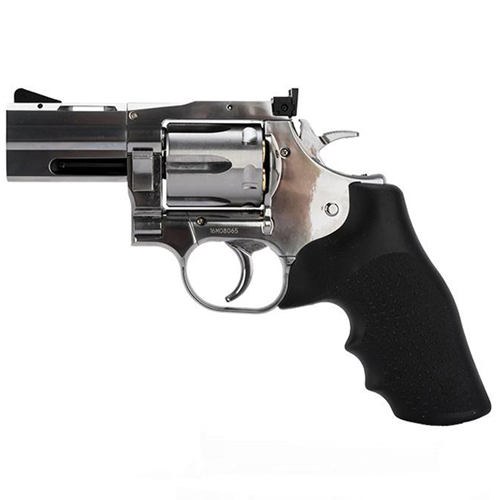 The revolver is made entirely of metal except for the Hogue-style rubber grip. The 12g CO2 cartridge is stored in the grip and is easily accessed by sliding the grip back – easy-load style. Each of the 6 cartridges holds one 4.5mm BB and is placed in the metal cylinder.